Hawai’i banned octinoxate and oxybenzone in sunscreens with a bill that goes into effect in 2021. Since then Palau has followed suit, while many other countries concerned about the decline of their coral reefs and contamination of their marine life are debating the issue. Other cities and states across the U.S., inspired by the success in Hawai’i, are working on their own bans as well, including the Florida Keys where their corals have been decimated. Though there are many factors at play, having sunscreens in the waters decreases the opportunity for coral restoration. We’ve created many tools used in our work on the Hawai’i “Sunscreen Bill” that we will be sharing, including this updated Mineral Sunscreen Collage* we printed as signage for our Sunscreen Rally held at the Hawai’i State Capitol Building last spring, which helped push the bill forward. 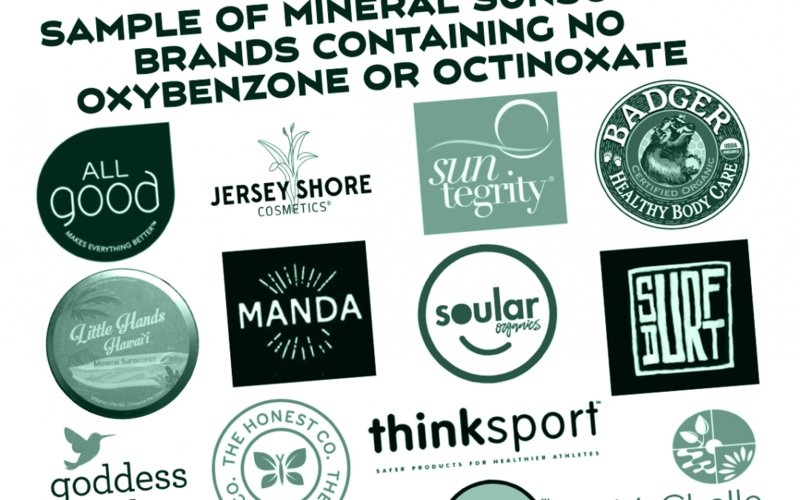 It addresses the argument that if you ban sunscreens with oxybenzone and octinoxate you will be left with no options for people who want to protect themselves from exposure to UV rays. Fact is, the quality mineral options are not only safer, but typically offer much better SPF protection. Please feel free to utilize anything we’ve produced on our web site, whether sharing online or printing (there is a download button on the PDF below). Simply tag us, link back to us and / or credit our work. Mahalo for helping protect people, corals, marine life by educating and legislating on safer sunscreens! *There’s been an explosion of mineral sunscreen brands! Again this is simply a small selection of those containing no oxybenzone or octinoxate that are available in the U.S. If you have a brand you’d like featured in future signage, our upcoming Safe Sunscreen Guide, or included in the next Safe Sunscreen Box, please send a sample with ingredient list to BTS, PO Box 1208, Kilauea, HI 96754. Note: we have a more comprehensive list of ingredients we do not like to see in sunscreens, from skin irritants, allergens, carcinogens, hormone disruptors, nano-particles, fragrances.